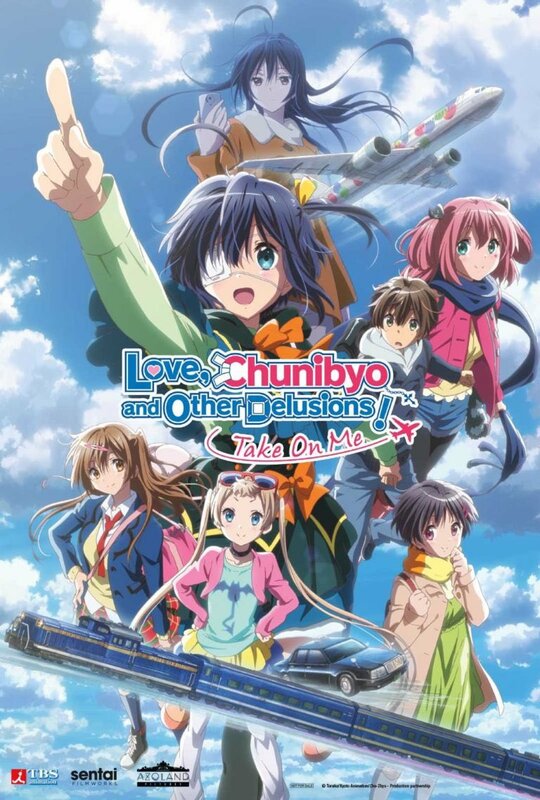 Azoland Pictures has announced that they are bringing Love, Chunibyo & Other Delusions! -Take On Me- to select theaters in the US and Canada this coming November. The film is a continuation of the TV anime, Love, Chunibyo & Other Delusions -Heart Throb-. Like the TV anime series, the film is produced by Kyoto Animation. Yuta and Rikka may have finally started to come to terms with the various delusions that have run their lives, but as their relationship becomes progressively more real, their development as a couple seems to be increasingly in danger of stalling out! When your relationship is partially the result of a series of fantasies, what can reality serve up that’s equal to the make-believe? Rikka’s sister decides that she’s going to move to Italy and take Rikka with her, and the solution that Rikka and Yuta decide on is both improbably logical and unrealistically practical: They’re going to elope! For real! Get ready for the ultimate fantasy road trip as our two young would-be lovers take off a whirlwind tour of the real Japan in Love, Chunibyo & Other Delusions! -Take On Me-. The original light novel series was written by Torako and illustrated by Nozomi Ōsaka. It has inspired a number of different adaptations including two TV anime seasons, an original net animation, another anime film, and an OVA. All prior anime adaptations are licensed for release in North America by Sentai Filmworks. Love, Chunibyo & Other Delusions! -Take On Me- is set to premiere in select theaters in the US and Canada in early November 2018. You can check out a list of theaters screening the film via Azoland Pictures’ official website HERE.